How can small-scale farmers navigate those hurdles and achieve food security? Kevin Henry, the project coordinator for CARE International’s Where the Rain Falls campaign; Susan Bradley, the division director for USAID’s Bureau for Food Security, which implements the U.S. government’s Feed the Future initiative; and ECSP consultant Kathleen Mogelgaard joined Hanson earlier this month to discuss that question. Many small-scale farmers rely on basic tools, minimal technology, and rainfall to cultivate their crops, which exacerbates their vulnerability to changing weather patterns and other stressors that affect food security. But, Hanson said, this vulnerability also represents a “tremendous opportunity,” because small improvements, like better access to seed and fertilizer, can yield outsized benefits. 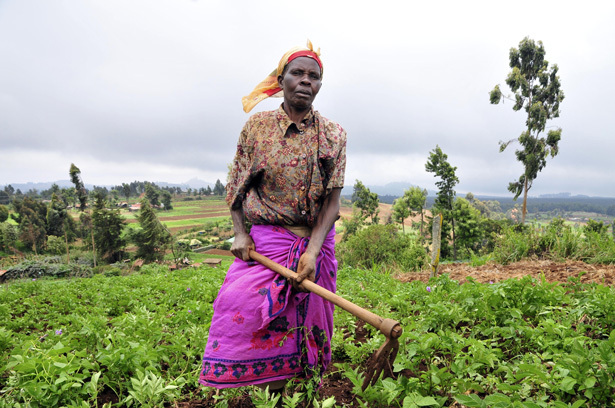 The experience of Carolyn Lunani, a farmer that works with One Acre Fund in western Kenya, demonstrates how simple interventions can benefit small-scale, food-insecure farming households, said Hanson. Through her partnership with One Acre Fund, Lunani received seed for local crops and fertilizer on credit, and was trained to use both to maximize crop yields. She also received crop insurance through the Fund, which triggers payments when local weather stations show insufficient rainfall during key parts of the planting season. Since joining the Fund in 2009, Lunani has gone from growing 1 bag of maize on one acre of land to growing 80 bags on three acres, said Hanson. She also bought a cow, built and owns four rental properties, and is paying for her children to attend nursery school and secondary school. Boosting Yields for Improved Nutrition? While greater agricultural productivity yields clear benefits for farmers, Bradley cautioned that bigger yields aren’t a cure-all. Feed the Future’s two goals – improving agricultural productivity and boosting nutrition – underscore the fact that food security is about quality of food as much as it is about quantity, she said. But linking the two can be challenging. For extremely poor and landless households, agricultural interventions do little to improve their food security. Instead, these households are “most often basically forced to use migration as a risk management strategy,” said Henry. In the Janjgir-Ghampa District of India’s central Chhattisgarh State, where 24 percent of households don’t own the land they work, farmers rely on a single crop of rice to feed their families for the year. Increased variability during the rainy season has left these farmers extremely susceptible to crop failure and resulting food insecurity. At the same time, population growth coupled with traditional inheritance practices mean that even the farmers who do own land have to feed bigger families with increasingly smaller tracts, according to recent CARE research. Seasonal migration to urban areas remains one of the few ways these farmers can hope to earn enough to feed their families when the monsoons fail to deliver. Given the vast complexity of the challenge at hand, said Henry, there is a need “to get out of our silos, if you will, and to get beyond thinking of food security over here, and climate change here, and sustainable development over here.” Working across sectors also means doing more to strengthen natural disaster risk management capacity, from building up institutions and networks at the regional and national levels to educating farmers and empowering women at the community and household levels, he said. Photo Credit: “2DU Kenya 87,” courtesy of the International Center for Tropical Agriculture.